Sometimes we want to reject Exchange mail sender according to a certain criteria. Suppose you want to block all e-mails addressed to a particular domain. This is easily done in Exchange admin center. 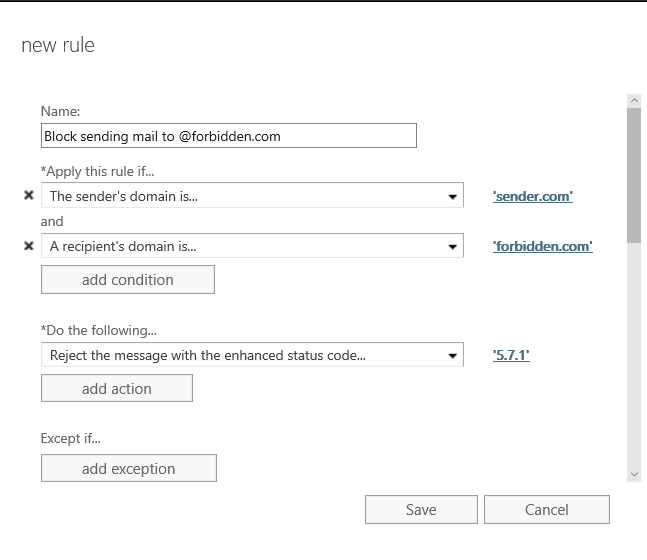 Create new Mail flow rule, as shown below. ‘’Reject the message with the enhanced status code’’, where you must enter so called NDR (Non-delivery reports) code. NDRs are system messages that report the delivery status of a message to the sender. NDRs are generated when a message cannot be delivered. If the computer can detect the reason for the failed delivery, it maps the reason onto a status code, and a corresponding error message is printed. For NDRs, most numeric error codes are reported in the form of “5.X.X” and are described as permanent failures. Get-SystemMessage –Original to display just embeded ones. 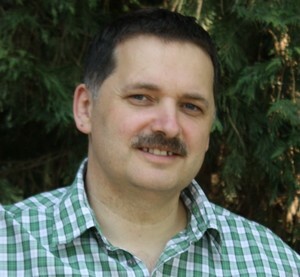 Any system message can be rewritten, if you are not satisfied with the original. Set-SystemMessage En\Internal\5.7.1 -Text “Write here your custom message” Overwrites original message with custom message. We are employed at School Center Nova Gorica (SCNG), which is located in Slovenia-EU and we are enthusiastic about new technologies, especially in Microsoft Technologies. We would like to share our knowledge, thoughts and solutions in different areas of Information Technologies.